Hi all! Hoping to brighten up the past few gloomy days with this ootd featuring Nikola in Garfield Apparel from SM Kids Fashion. This is her favorite outfit so far among the 3 we've done. Our theme was cool and quirky with a bit of a rock edge and there's no toon to better exemplify that than Garfield, don't you think? Funny thing about Garfield Apparel is that we go way back. Seriously. It was my favorite brand growing up. Back then, most of their line-up consisted of unisex cotton t-shirts with graphic prints of Garfield and sometimes his friends from the Orson Farm? Remember? :) Me and my brother used to have matching Garfield tees all the time. The one I wore most often was a black tee with a picture of Garfield doing what he does best, sleeping! Today, their line has diversified into really cute, gender-specific, trendy clothes like this sequined black denim shorts and metallic sweater of Nikola. This set is probably one of our most favorite shopping finds from SM Kids Fashion as well as this red coat that we were able to purchase for only P250. How about you? What's your favorite SM Kids Fashion shopping find? Answer this question for a chance to win P1500 worth of SM gift certificates and a special SM Kids Fashion Toonfest lootbag! My best shopping find at SM Kids Fashion are quality shirts and dresses that never get out of style..
Awww super cute nug last photo ni Nikola and bet ang styling!!! My best shopping find at SM Kids Fashion I bought for my Queen are doll shoes. Affordable and always in fashion. My best shopping find at SM Kids Fashion are the stylish pink shoes, hello kitty dress and Disney (Winnie the Pooh) pajamas for my daughter! my best shopping find at SM Kids Fashion is a pair of funky pink rain boots. Garfield Shirt and Polo Shirt with Khaki Shorts! I like the cute dresses. I was once able to stumble upon a buy-1-take-1 on Sugar Kids shoes! I love the disney character shirts for my kids, quality and affordable! At their footwear section, I always have the eye in finding great finds of shoe items at a very affordable prize. Always the buy1 get1 Ballet flats with many colors and designs to choose from. I enjoy the wide selection of their shoes may it be for my kids, for my hubby or for me, We love shoes! Disney character especially CARS are also one of the best. pink shoes and hello kitty dresses for my lovely daughter! My nieces would want to have any barbie printed/ princess like dresses :) I am pretty sure they would love it. What is your best shopping find at SM Kids Fashion? Sugar shoes & a cute dress. Worth every penny. 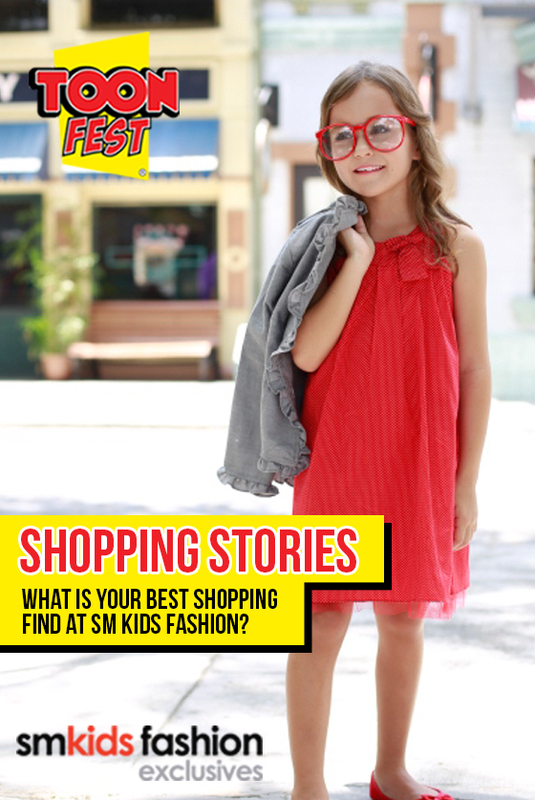 What is your best shopping find at SM Kids Fashion? My best shopping find at SM Kids Fashion for my son shoes HOTWHEELS, BEN10, Garfield shirts and pants, Mickey Mouse shirts, polo, hankie, shoes, briefs, sunglasses & bags. My favorite shopping find at SM Kids Fashion - cool colors garfield shirts and shorts and is my favorite gift for my Godson. My favorite shopping finds at SM kids fashion are Garfield shirts and jeans for my son because the prints are trendy and very comfortable to wear. SM had always been my first choice for my two girls clothing paraphernalia. But the best thing I bought from SM are two pairs of fashionable boots for my two girls! I love shopping for my one and only son and he likes polo with hoods and hats. I love shopping for my niece and nephews,I just like sm's wide selection of dresses and shirts. One of the best shopping find that I've had was last July, my children were requesting me to buy them new shoes/sandals so while looking around, something caught my eye.. its a buy 1 take 1 shoes for only 399. It is the Sugar Kids and Tough Kids brand. My kids and I fell in love with the selection of shoes on sale they were all fashionable, comfortable to wear and the best of it all, it is budget friendly! I will definitely buy shoes again from that brand on Christmas. My favorite shopping finds at SM kids fashion are Garfield shirts and their stylish shoes! What is your best shopping find at SM Kids Fashion? Dresses and sandals!